Dr. Greene’s Organic Rx — Item #1. Organic Milk. 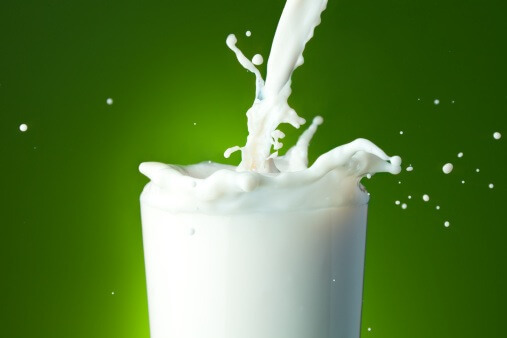 There’s more to a glass of milk than meets the eye. You see the milk, but hidden from view is the cow it came from, the dairy where the cow was raised, and all of the land devoted to growing food for that cow. It’s a huge opportunity. When you choose a glass of conventional milk, you are buying into a whole chemical system of agriculture. When you buy a glass of organic milk you’re creating more benefit than you see. When parents start making organic choices they often intuitively start at the top of the food chain, with organic milk, if dairy is part of their family’s diet. When moms understand that the food they eat and the medicines they take can go into their breast milk, they often make the connection that the medicines and foods given to dairy cows can affect their family’s health. They prefer avoiding the routine use of antibiotics, artificial hormones, pesticides, and genetically modified feed. And with good reason. Some recent USDA monitoring data found synthetic pyrethroid pesticides in 27% of conventional milk samples, and in only one organic sample – and even that at a lower level7. Some people who switch believe organic milk is better for their families8 because of omega-3 fatty acids9 or the antioxidant beta-carotene10. Others may choose organic milk because they prefer the taste, or as a means of supporting responsible, compassionate animal care. I picture each glass of organic milk as the tip of an organic iceberg. Rich, living soil, responsibly nurtured, produces healthy organic pasture and nutritious organic feed, which leads to healthy organic cows. (Organic cows must, by regulation, be allowed to graze on pasture during the growing season.) Organic milk represents a whole organic ecosystem. If you drink milk, choose organic every time. An astonishing 200 million acres of farmland in the US are devoted to growing feed for our livestock11. By choosing to drink organic milk, or to eat cheeses or yogurts made from organic milk, you are pulling a little lever to effect a big change. If you go to a fast food restaurant, ask for organic milk (or water or some other healthy beverage – let your beverage be a positive choice). Ask for it in your schools. If you eat ice cream, look for it there. If we join together to pull this lever, imagine what could happen. The popularity of organic milk has already resulted in many conventional farmers choosing to raise cows without the use of artificial growth hormones. This is a big accomplishment, brought about by consumer trends. If we keep choosing organic milk, we can expect similar changes in the whole system – as well as good nutrition – and a cleaner environment – for our families. 7Benbrook CM. FAQS on Pesticides in Milk. Organic Center. December 2006. Calculated from USDA’s Pesticide Data Program, 2005. 8Bergamo, P, et al. Fat-soluble vitamin contents and fatty acid composition in organic and conventional Italian Dairy products. Food Chemistry. 82:625-631. 2003. Dewhurst R, Fisher W, Tweed J, Wilkins R. Comparison of grass and legume silages for milk production. Journal of Dairy Science. 2003; 86, 2598-2611. 9Robertson J and Fanning C. University of Aberdeen. Omega 3 Polyunsaturated Fatty Acids in Organic and Conventional Milk. University of Aberdeen Press Release, December 8, 2004. Aberdeen Press Release, December 8, 2004. 11Jacobson, MF. Six Arguments for a Greener Diet. Center for Science in the Public Interest. Page 11, July 2006. I cross referenced this statistic with USDA data. Certified organic and total U.S. acreage, selected crops and livestock, 1995-2005. USDA. December 15, 2006. http://www.ers.usda.gov/Data/Organic/Data/Certified%20and%20total%20US%20acreage%20selected%20crops%20livestock%2095-05.xls accessed Feb 5, 2007. In 2005, 62 million acres were in hay and silage, 82 million acres in corn, 72 million acres in soy, 57 million acres in wheat, 6 million acres in sorghum, 4 million acres each in oats and barley, and a million acres in rye. This was in addition to 456 million acres in pasture and rangeland. If anything, the 200 million acres is a conservative estimate. Milk?! It doesnt matter if its healthy, It shouldnt be consumed! Period! The mistreatment of cows is beyond worse already. There will be people who will always recommend cruel products… People need to disappear from earth. They claim Global Warming, yet they’re the cause of it! Bringing more people into this earth will cause more pollution & Global Warming! You don’t want to admit people are the cause so they look for other “excuses”! People are cause for everything!